Facebook has added two new relationship status options users can include in their online profiles: "in a civil union" and "in a domestic partnership." The new fields are being rolled out in the U.S. and several other countries, including Canada, France, the U.K., and Australia, starting today. "This has been a highly requested feature from users," said Facebook's Andrew Noyes, manager of public policy communications. "We want to provide options for people to genuinely and authentically reflect their relationships on Facebook." Among other information included on their Facebook profiles, such as their alma mater and favorite books, users also have the option to characterize their relationships. Previously, the set of options included: single, in a relationship, married, engaged, it's complicated, in an open relationship, widowed, separated, and divorced. The changes were made in consultation with Facebook's Network of Support, a group that includes LGBT [lesbian, gay, bisexual, transgender] organizations such as the Gay and Lesbian Alliance Against Defamation, the Gay, Lesbian, and Straight Education Network, and the Human Rights Campaign. "As LGBT people face a patchwork of relationship recognition laws, this gives people more tools to adequately describe their relationship," said Michael Cole-Schwartz, spokesperson for the Human Rights Campaign. "Facebook has been a company that has tried to be inclusive of the LGBT community and this just one sign of it." Richard Socarides, president of Equality Matters and former gay rights advisor to president Bill Clinton, echoed Cole-Schwartz's praise. "Facebook has always been an empowering place for gay people--it's a place you can be yourself in relative safety," Socarides told the Huffington Post in an email. "This is a natural progression of that. In most places, gay Americans can't yet marry but they may be able to formalize their relationship short of marriage. This change reflects that reality. Well done." Although Facebook's new relationship status options mark a milestone for the LGBT community, Cole-Schwartz noted that challenges remain, particularly when it comes to dealing with cyberbullying, harassment, and hate speech online. "There are people who are vulnerable and people who are going to be bullies online and people need to have the right tools to keep up with that," Cole-Schwartz said. "That will continue to be something that all online spheres wrestle with and need to be cognizant of." 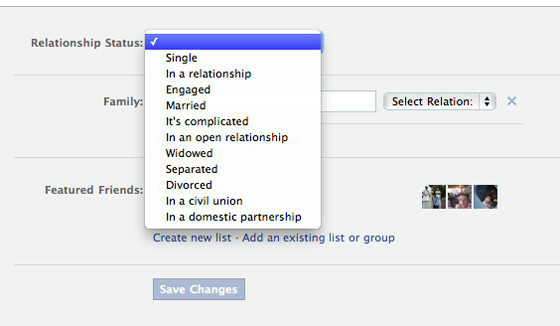 See the screenshot of the new relationship status options below.